The running game is big keys for both of these teams and I think this match up is pretty even across the board. 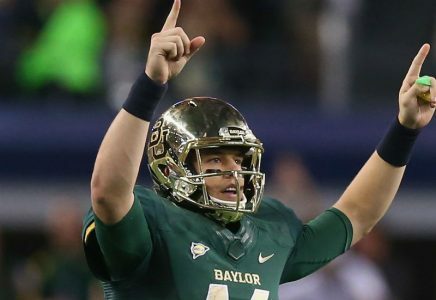 Baylor is 0-12 at Oklahoma, but it’s time to change that. This defense held Oklahoma to 237 yards last year and Oklahoma has struggled to beat teams who rank in the top 40 in yards/play on offense and defense. Both TCU & Kansas State fall into that category at 8/38 and 32/29 as truly balanced teams and Oklahoma lost at home to Kansas State. Baylor is ranked 23rd in offense and 11th on defense in yards/play. Just too much balance for Oklahoma to win this game by a TD. I am 6-0 on Teasers of the week’s this year which you can find tracking for on monitorsportspicks. The value is there for this Baylor team at over a TD + FG at +11.. I’m going to tease it with Notre Dame +8.5 which will be a 4.4* play! Notre Dame and Arizona State face off in another big match up on Saturday. Both teams will face top tier QB’s with next level talent. Both defenses have already faced the top 2 QB’s in the nation. Arizona State got blown off the field by UCLA at home and Brett Hundley who had 355 yards 4 TD 0 INT”s and rushed for 72 yards on 8 carries, as they lost 27-62. Notre Dame meanwhile kept Jameis Winston in check 23/31, 273 yards 2 TD and 1 INT. Notre Dame can do the same with Taylor Kelly who is playing just his second game off his injury. Everett Golson is every bit as dangerous as Brett Hundley and I think he’s got better players around him. Notre Dame is balanced ranking 30th in yards per play offense and 44th on defense. Arizona State’s 50th ranked defense will have issues containing Golson and this Notre Dame offense especially coming off a win vs. Utah in OT. I’m probably going to parlay these two on the ML as I can see both road teams in position for a win.